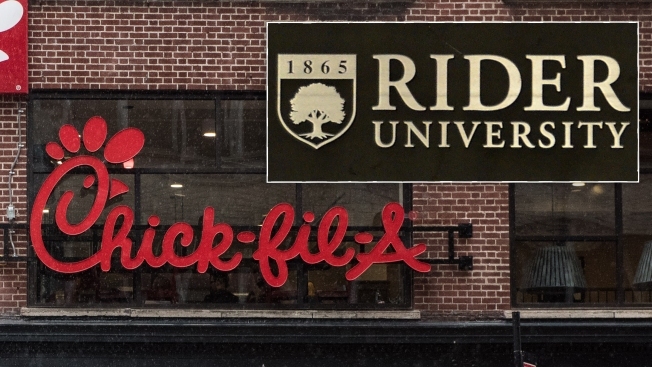 Rider University (inset) struck fast food chain Chick-fil-A from a list of franchises allowed on its campus, citing Chick-fil-A's record on LGTBQ+ issues. Students at a private university in New Jersey can eat more chicken as long as it's not Chick-fil-A. Rider University removed the restaurant from a survey of dining options "based on the company's record widely perceived to be in opposition to the LGBTQ+ community." The fast-food chain was included in previous surveys. Rider says it understands some may view the decision as a "form of exclusion" and called the decision "imperfect." But the school says it wanted to be "faithful to our values of inclusion." "We understand that some may view the decision as being just another form of exclusion," University President Dr. Gregory G. Dell’Omo and Vice President of Student Affairs Dr. Leanna Fenneberg said in a joint statement. "We want to be clear that this was not the spirit in which the decision was made. We fully acknowledge an organization’s right to hold these beliefs, just as we acknowledge the right for individuals in our community and elsewhere to also personally hold the same beliefs." The university plans to hold a campus forum on the issue so that all voices can be heard.